Given the increasing traffic, city commuting has never been more inconvenient and challenging. However, e-rickshaw is emerging as an effective solution to cope with inconvenience commonly faced in city commuting. It is easy to board on an e-rickshaw as it doesn’t have clunky doors. The open design of e-rickshaws help in avoiding congestion commonly faced in public buses. Plus, the suspension system adds more comfort. One of the biggest advantages of using e-rickshaws is they are eco friendly. How? E-rickshaws don’t use a combustion engine. Instead, they use a high torque electric motor which powers the rear wheels. The electric motor draws power from the batteries which are generally placed underneath the seat bay. As e-rickshaws solely rely on electric power, they don’t cause air pollution. An e-rickshaw is fairly easy to ride as the drive train has a simple mechanism. Unlike auto rickshaws, you don’t have to deal with clutch and gears when riding an e-rickshaw. Also, switching from a conventional rickshaw to an e-rickshaw is simple. This is because the chassis of both are almost similar. Given that e-rickshaws have a simple chassis and working mechanism, they are easy to maintain. The open design of the chassis makes it easy to clean and check for damages. 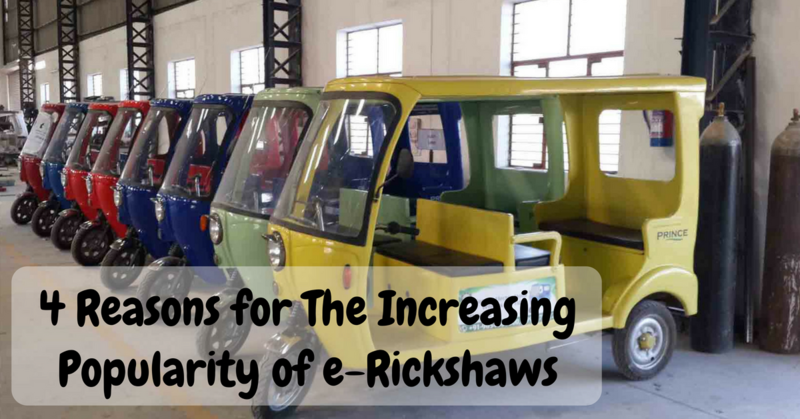 E-rickshaws have a longer working life as their chassis has a durable construction. SF Sonic e-rickshaw batteries have high starting power and good endurance – providing instant ignition even after reasonable periods of idle stand. We design our e-rickshaw batteries for better vibration resistance. The ergonomic casing also makes our e-rickshaw batteries easier to handle. Our e-rickshaw batteries come factory-charged, eliminating the need to charge before use. Explore our products page at http://www.sfsonicpower.com/product/buyonline to learn more about our e-rickshaw batteries.